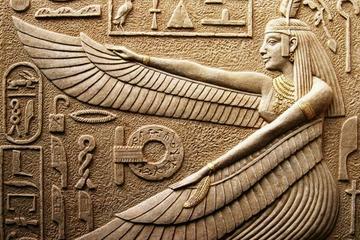 Home of the ancient Pharaohs, Egypt is a dazzling destination of temples and tombs that wow all who visit. It's not all historic treasures, though. With vast tracts of desert, superb scuba diving, and the famed Nile River, there's something for everyone here. Beach lovers head to the Sinai to soak up the sun, while archaeology fans will have a field day in Luxor. Cairo is the megalopolis that can't be beaten for city slickers, while Siwa oasis and the southern town of Aswan offer a slice of the slow pace of the countryside. Egypt has so much for travelers to see and do, it's the perfect country for a mix of activities combining culture, adventure, and relaxation. 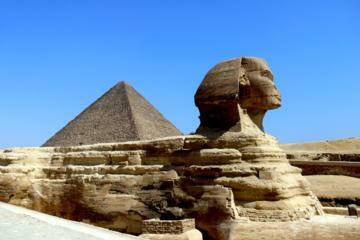 Find the best places to visit with our list of the top tourist attractions in Egypt. The last surviving of the Seven Wonders of the Ancient World, the Pyramids of Giza are one of the world's most recognizable landmarks. Built as tombs for the mighty Pharaohs and guarded by the enigmatic Sphinx, Giza's pyramid complex has awed travelers down through the ages and had archaeologists (and a fair few conspiracy theorists) scratching their heads over how they were built for centuries. Today, these megalithic memorials to dead kings are still as wondrous a sight as they ever were. An undeniable highlight of any Egypt trip, Giza's pyramids should not be missed. Famed for the Valley of the Kings, Karnak Temple, and the Memorial Temple of Hatshepsut, the Nile-side town of Luxor in Upper Egypt has a glut of tourist attractions. This is ancient Thebes, power base of the New Kingdom pharaohs, and home to more sights than most can see on one visit. While the East Bank brims with vibrant souk action, the quieter West Bank is home to a bundle of tombs and temples that has been called the biggest open-air museum in the world. Spend a few days here exploring the colorful wall art of the tombs and gazing in awe at the colossal columns in the temples, and you'll see why Luxor continues to fascinate historians and archaeologists. The atmospheric, narrow lanes of the capital's Islamic Cairo district are crammed full of mosques, madrassas (Islamic schools of learning), and monuments dating from the Fatimid through to the Mameluke eras. This is where you'll find the labyrinth shopping souk of Khan el-Khalili, where coppersmiths and artisans still have their tiny workshops, and stalls are laden with ceramics, textiles, spice, and perfume. Surrounding the market is a muddle of roads, home to some of the most beautiful preserved architecture of the old Islamic empires. There is a wealth of history here to explore. Visit Al-Azhar Mosque and the dazzling Sultan Hassan Mosque, and make sure you climb to the roof of the ancient medieval gate of Bab Zuweila for the best minaret-speckled panoramas across the district. Egypt's most tranquil town is Aswan, set upon the winding curves of the Nile. Backed by orange-hued dunes, this is the perfect place to stop and unwind for a few days and soak up the chilled-out atmosphere. Take the river ferry across to Elephantine Island and stroll the colorful streets of the Nubian villages. Ride a camel to the desert monastery of St. Simeon on the East Bank. Or just drink endless cups of tea on one of the riverboat restaurants, while watching the lateen-sailed feluccas drift past. There are plenty of historic sites here and numerous temples nearby, but one of Aswan's most popular things to do is simply kicking back and watching the river life go by. Even in a country festooned with temples, Abu Simbel is something special. This is Ramses II's great temple, adorned with colossal statuary standing guard outside, and with an interior sumptuously decorated with wall paintings. Justly famous for its megalithic proportions, Abu Simbel is also known for the incredible feat, which saw the entire temple moved from its original setting — set to disappear under the water because of the Aswan dam — during the 1960s in a massive UNESCO operation that took four years. A treasure trove of the Pharaonic world, Cairo's Egyptian Museum is one of the world's great museum collections. The faded pink mansion is home to a dazzling amount of exhibits. It's a higgledy-piggledy place with little labeling on offer and not much chronological order, but that's half of its old-school charm. Upstairs is the golden glory of King Tutankhamen and the fascinating royal mummies exhibits, but really every corner you turn here is home to some wonderful piece of ancient art or statuary that would form a highlight of any other museum. Egypt's kookiest natural wonder is the White Desert, where surreally shaped chalk mountains have created what looks like a snowy wonderland in the middle of the arid sand. The landscapes here look like something out of a science fiction movie, with blindingly white boulders and iceberg-like pinnacles. For desert fans and adventurers, this is the ultimate weird playground, while anybody who's had their fill of temples and tombs will enjoy this spectacular natural scenery. Way out west, Siwa is the tranquil tonic to the hustle of Egypt's cities. This gorgeous little oasis, surrounded by date palm plantations and numerous fresh water springs, is one of the Western Desert's most picturesque spots. The town is centered around the ruins of a vast mud-brick citadel that dominates the view. This is a top spot to wind down and go slow for a few days, as well as being an excellent base from which to plan adventures into the surrounding desert. The most European of Egypt's cities, Alexandria has a history that not many others can match. Founded by Alexander the Great, home of Cleopatra, and razzmatazz renegade city of the Mediterranean for much of its life, this seaside city has an appealing days-gone-by atmosphere that can't be beaten. Although today, there are few historic remnants of its illustrious past — feted in songs and books — this is a place made for aimless strolling along the seashore Corniche, café-hopping, and souk shopping. One of the oldest monasteries in the world, St. Catherine's stands at the foot of Mount Sinai, where Moses is said to have received the Ten Commandments. This desert monastery is home to an incredible collection of religious iconography, art, and manuscripts (some of which can be seen in the on-site museum), as well as the burning bush. For most visitors here, a trip to St. Catherine's also involves a hike up Mount Sinai to see sunrise or sunset. Take the camel path for the easy route or climb the famous Steps of Repentance if you want better views. Egypt's center for beach fun is the South Sinai region on the Sinai Peninsula. Sharm el-Sheikh is a European-style resort full of luxury hotels, international restaurants, and bags of entertainment options. Dahab is a low-key beach town with a budget-traveler heart, which is just as much about desert excursions and adventures as the sea. Up the coast, between the port town of Nuweiba and the border town of Taba, are the bamboo hut retreats that offer complete get-away-from-it-all respites from life. Wherever you choose, the South Sinai is all about diving. The Red Sea is one of the top diving destinations in the world, and the South Sinai region is home to most of the best dive sites. Dusty Abydos town wouldn't make much of a rating on the tourism radar if it wasn't for the incredible temple on its doorstep. Abydos' Temple of Osiris is one of ancient Egypt's most fascinating artistic treasures. Its chunky columns and walls, covered in beautiful hieroglyphics and intricate paintings, are spellbinding sights, and even better, you can admire them without the crowds as despite its dazzling beauty, it receives few visitors compared to the temples in nearby Luxor. Below the Red Sea's surface is another world as fascinating as the temples and tombs on land. Among the many coral reefs off the coast there's also a glut of shipwrecks that have sunk in the Red Sea's Gulf of Gubal and Gulf of Aqaba. Of all the wrecks, the most famous is the Thistlegorm, an English WWII cargo ship that was on its way to resupply British troops when it was bombed by the Germans in 1941. Today the site is regarded by divers as one of the top five wreck dives in the world due to the vast cargo of cars, motorbikes, and WWII memorabilia that can be seen both scattered on the sea bed around the wreck and inside the ship itself. Dive boat trips to the wreck are organized from both Sharm el-Sheikh and Hurghada. Egypt is defined by the Nile. For many visitors a multi-day cruise upon this famed waterway that saw the rise of the Pharaonic era is a highlight of their Egypt trip. Cruising the Nile is also the most relaxing way to see the temples that stud the banks of the river on the route between Luxor and Aswan, plus sunrise and sunset over the date-palm-studded river banks, backed by sand dunes, is one of Egypt's most tranquil vistas. The two famous sights on a Nile Cruise are the Temple of Kom Ombo and Edfu's Temple of Horus, where all the big cruise boats stop. If you'd prefer a less crowded and slower experience though, and don't mind "roughing it" a bit, you can also cruise the Nile by felucca (Egypt's traditional lateen-sailed wooden boats), which also allows you to create your own itinerary. Cruise boats depart from both Luxor and Aswan, but feluccas can only be chartered for multi-day trips from Aswan. Everyone's heard of Giza's Pyramids, but they're not the only pyramids Egypt has up its sleeve. Day-tripping from Cairo, Saqqara is the vast necropolis of the Old Kingdom pharaohs and showcases how the Ancient Egyptians advanced their architectural knowledge to finally create a true pyramid with the Step Pyramid, Bent Pyramid, and Red Pyramid being among the highlights here. The various tombs of court administrators, with interior walls covered with friezes describing daily scenes, scattered throughout the archaeological site are just as much a reason to visit as the pyramids themselves.